Fall Baking With Your Children - Energetic Juniors - Contact Us! This time of the year, I love baking, especially with spices like cinnamon and nutmeg that fill the house with a delicious smell. 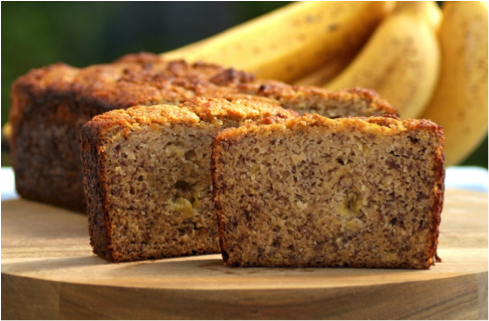 I love this easy banana bread recipe that you can enjoy baking with your children, and it has absolutely no sugar of any kind added. It makes a great breakfast with some almond butter, a lunch box sandwich with some crushed raspberries and sunflower seed butter, or even after school snack. It is filled with healthy carbohydrates, fiber, fat and protein without any of the refined sugar. 2. Combine the bananas, eggs, almond butter, and butter in a blender, food processor, or mixing bowl and mix well. 3. Add in your coconut flour, cinnamon, baking soda, baking powder, vanilla, sea salt and any additional optional add-ins, and mix well. 4. Pour batter in loaf pan (grease well with coconut oil or butter). 5. Bake for 55-60 minutes or until toothpick inserted into the center comes out clean. 6. Remove from oven and flip onto a cooling rack. 7. Slice and serve.The bread can keep in an airtight container for 3 days on the countertop or 1 week in the fridge.